The Brigham City Police Department Patrol Division has a six-member Bike Unit which is under the supervision of Lt. Chris Howard. Members include Officer Josh Lyman, Corporal Chad Panter, Detective Nate Small, Detective Joe Thomas, Detective Ryan Hill and Officer Kyle Whitaker. These bike patrol officers are trained in bike handling skills and related techniques and tactics. Bike patrol officers are more visible to citizens and are said to be more approachable. Their less formal uniforms and common link of a bicycle also attracts young people to these officers. When citizens, young and old alike, develop a relationship with the officers, it builds trust and appreciation. This benefits both the community and the Department. Bike patrol officers are invaluable for patrolling crowded events, the downtown business area, and other areas not easily accessible by patrol vehicles. The Department depends heavily on its Bike Unit for special assignments such as the annual Peach Days parade and carnival. The Bike Unit is also used for special appearances, crime prevention functions, bike rodeos, and for bicycle safety education. For more information or to schedule a bicycle rodeo, please call the Brigham City Police Department at (435) 734-6650. Officers in the Patrol Division are responsible for patrol operations and handling daily calls for service. Their duties include routine patrol and traffic enforcement, responding to emergency and in-progress calls, as well as crime prevention through proactive community-oriented policing. The Patrol Division consists of three separate shifts, providing 24-hour coverage to the citizens of Brigham City. The Patrol Division is the backbone of the Police Department. The highest volume of complaints received by the Police Department involve speeding and bad driving. The "High Intensity Traffic Enforcement Program" is designed to provide intensive enforcement in problem areas with "zero" or very low tolerance for violations of the traffic code. The program is not a replacement for routine enforcement efforts, rather it is a program for problem areas within the City. Areas of enforcement are identified according to citizen complaints of violations and/or traffic accident/problem ratios which are higher than in other areas of the City. An officer assigned to do the enforcement is relieved of other duties such as answering calls for service. If available, an unmarked police vehicle is used. Portable "High Intensity Traffic Enforcement" signs are posted during the enforcement effort. The Brigham City Police Department is committed to the apprehension of criminals and the prevention of the possession of illegal drugs within Brigham City. One of the greatest tools provided the department is the use of its K-9 unit. 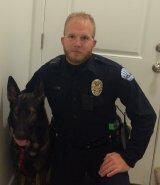 Officer Ethan Jorgensen and his partner Disciple are a tremendous asset to the K-9 program. Disciple von Havoc Krieghund (a.k.a. Disciple) is a 3-1/2-year-old male German shepherd. 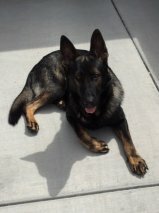 He came to the BCPD from Havoc K-9, a Utah company. Disciple is dual certified in narcotics detection and patrol/apprehension. Brigham's K-9 Division has handled calls for service ranging from traffic stops where the K-9s were used for narcotics detection, to public demonstrations. K-9s are dedicated primarily to the safety of their handlers, however, teams are also used for, but not limited to, tracking, evidence recovery, criminal apprehension, building searches and drug detection. One of the on-going goals of the K-9 Division is to increase the number of demonstrations for public groups and provide special request services (e.g., searching newly purchased homes and automobiles that may have had previous drug activity). If you have any questions regarding any of these services, please feel free to contact the Brigham City Police Department at (435) 734-6650. The Brigham City SWAT (Special Weapons and Tactics) Team is used to resolve situations that require tactics and weaponry not normally available to uniform patrol officers. The SWAT Team is an extra assignment that is a voluntary position requiring specialized training and dedication on the part of the officers involved. Some of the situations encountered by the SWAT Team are barricaded gunmen, hostage scenarios, arrests of dangerous individuals, events involving large numbers of people and threats to the security of dignitaries. The team also helps execute search and arrest warrants where extra security precautions are necessary to insure the safety of officers and suspects alike. Through the Excess Property Sharing Program, the Brigham City Police Department has acquired an armored personnel carrier (APC). The APC is not a weapon-bearing vehicle; rather, it is a hardened personnel transportation unit designed to travel over rough and difficult terrain. The unit can be used for many things including protecting SWAT officers during high-risk, volatile approach and entry situations. In May of 2014, the SWAT Team acquired, through the Utah Federal Surplus Property Program, a six-wheeled Caiman mine resistant armored personnel vehicle (MRAP). The MRAP will be used for protecting SWAT officers during high-risk, volatile approach and entry situations. The Box Elder Narcotics Strike Force is comprised of law enforcement officers from the Brigham City Police Department, Box Elder County Sheriff's Office, and Tremonton City Police Department. These agents are specially trained in drug recognition, surveillance, clandestine lab investigation, prescription medication offenses, handling of evidence, and the investigation of illegal substances. They also help to educate the public through drug prevention awareness training. Drugs negatively impact our communities in many ways. In most communities the abuse of illegal drugs begins with alcohol misuse and experimentation with inhalants such as common spray paint. Fortunately, many children who experiment find the experience uncomfortable and form a negative evaluation of it. On the flip side, a large number find the experience rewarding and continue the activity with escalation to harsher substances such as methamphetamine, cocaine, morphine derivatives and club drugs. The use of these substances is very expensive with many addicts spending hundreds of dollars in a few days. Although statistically hard to prove, it is reasonable to believe these types of addictions are responsible for property crime offenses and violent crimes against persons -- activities such as theft, robbery, assaults, home invasions, etc. It is also easy to associate the use of illegal drugs to domestic violence, fraud and identity theft. 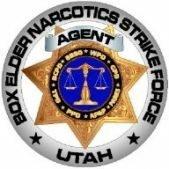 If you know of drug activity or are suspicious of activities in your neighborhood, please contact the Box Elder Narcotics Strike Force at (435) 734-6490. If you prefer to remain anonymous, you can leave the information on Brigham City Police Department's Tip-a-Cop line, (435) 723-1244. You can find our consortium statistics here. Methamphetamine/Amphetamine Fact Sheet | "The Faces of Meth Use"